It’s hard to believe, but we are near the end of the 2017 – 2018 school year, and Legacy’s first year of operations. We would like to invite you all to celebrate with us on Tuesday, May 8, 2018 at 5:30 pm we will present our 1st Annual Legacy Honors: One Legendary Teacher’s Appreciation Celebration. This will be a time to celebrate our partnerships, accomplishments and future endeavors. We cannot thank you all enough for your support through our inaugural year. This year has been a huge success because you believed in us! Please click here to purchase tickets. Looking forward to celebrating with you all on May 8th – National Teacher’s Appreciation Day! It is with great honor that we announce our keynote speaker for Legacy Honors: Doctor Eric Griggs. He is not only the familiar face of Health and Wellness in New Orleans, but Dr. Griggs is also a passionate community activist who is dedicated to serving the youth of our city. Dr. Griggs has continuously exhibited his long-term commitment to the city’s at-risk youth as evidenced by his many “extra-curricular” activities. Unbeknownst to many, this hard-working (yet soft-hearted) physician has previously served on the Broadmoor Charter School Board, co-founded and directed the Broadmoor Basketball Association, currently serves as the Director of Life Sciences for STEM NOLA, while also serving on the Board of Directors for Playworks Louisiana. Most recently, Dr. Griggs was appointed by Governor John Bel Edwards to the Louisiana Children’s Cabinet Advisory Board. For all these reasons and MORE, we proudly welcome “Doc Griggs” as the keynote speaker for Legacy’s Inaugural Legacy Honors: One Legendary Teacher’s Appreciation Celebration! 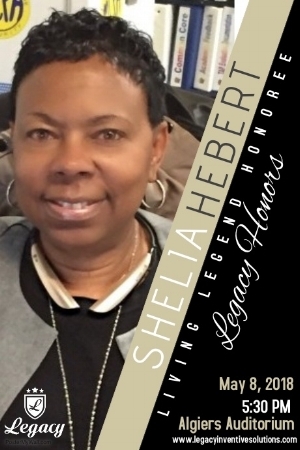 Legacy Inventive Solutions for Schools is extremely excited to honor Shelia Johnson Hebert as this year’s Living Legend. Ms. Hebert’s Legacy includes being an effective school leader, problem solver and communicator with 30+ years of experience in the areas of school transformation, reading, curriculum and instruction and team development. Mrs. Hebert believes in empowering teachers by building strong meaningful relationships. She has impacted student achievement by providing real life experiences, engaging and being a role model. Her Legendary career includes moving the needle on school performance, student achievement and school climate. Even in retirement, Ms. Hebert has continued to make an impact on educators, students and the community. Ms. Hebert truly exemplifies what it means to be a Living Legend! Congratulations Ms. Hebert, Legacy Honors: 2018 Living Legend! Legacy Inventive Solutions for Schools values community engagement and improving the quality of education for kids through a variety of experiences that meet their educational, cultural and social needs. This year we honor Mr. Gregory Ravy as our Legend in the Making for his significant contribution to the community through a non-profit organization he founded, Heroes of New Orleans (H.O.N.O.). H.O.N.O. is a grassroots community organization dedicated to improving health, educational attainment, human welfare, and opportunities for youth, adults, and families in New Orleans. At H.O.N.O., the dream is simple—the organization aims to give hope to children who are living in difficult conditions or disadvantaged socially and economically. H.O.N.O. extends their work to the seniors as well, as they too are an integral part of success and movement in the community. Congratulations Mr. Ravy, Legacy Honors: 2018 Legend in the Making! Get your tickets today! Click here for more information.